We will reward you for your decision to drive a climate-friendly and clean electromobile: receive a ticket at a reduced rate for your drive on the Grossglockner High Alpine Road! Get a stunning 10 Euros discount for your e-car and a saving of 6.50 Euros with an electronic bike. But that’s not all. There are electronic charging stations at the start of the alpine road in Bruck an der Glocknerstrasse in the north and Heiligenblut in the south. Coming from Salzburg, you’ll find another e-charging stations at the Haus Alpine nature exhibition and at the Hochtor. 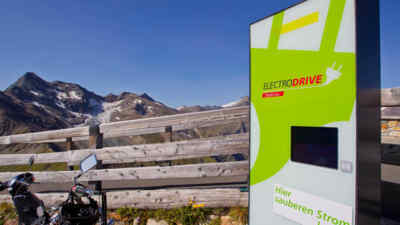 The highlight for electromobile drivers is Austria’s highest electronic charging station on the Kaiser-Franz-Josefs-Höhe. 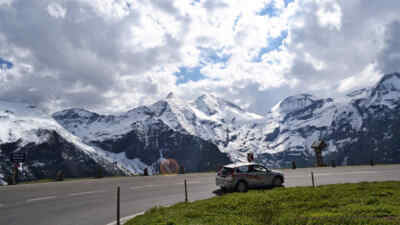 Enjoy the good feeling of particularly eco-friendly driving while looking at the Grossglockner!